Get your Gmail signature survey up and running in minutes. Switch it in or make it your default signature. Customise your rating buttons, or even use your own. The second your customer clicks a button, that vote is registered. Embedded Thermometers are only debited from your account allowance on a click – not a send. 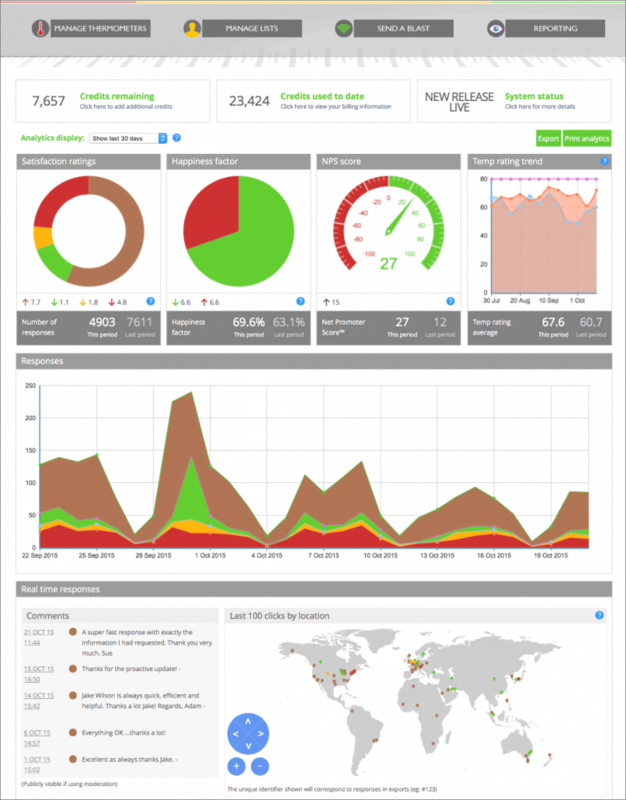 Sign up for a free trial account and check out Customer Thermometer Gmail surveys for yourself. Unlike all other uses of Customer Thermometer – Gmail signature clicks and comments are initially anonymous. This is a physical limitation of Gmail. After a recipient has clicked a response, they are taken to a landing page. This landing page can prompt for an email address which is then added to the response. Your customer clicks or taps a single icon on an email. They then get back to what they were doing. The days of 20 questions are over. An email from your company arrives… your customer can click their satisfaction rating wherever they are. Customer Thermometer works on all devices. Your customers want to give feedback – both good and bad. Embedding Thermometers in your emails gives them a simple mechanism to help them to help you. Real time, non-intrusive customer feedback. Customer satisfaction survey average response rates have been quoted as low as 5% . If there’s a problem, intercept it early. Maybe involve the CEO reward the account team? No coding or designers required. Ask your customers any question you want, customize your thank you pages to suit your brand and your tone of voice. Spend a couple of minutes finding out what’s possible by embedding Customer Thermometer into your business and across your teams. 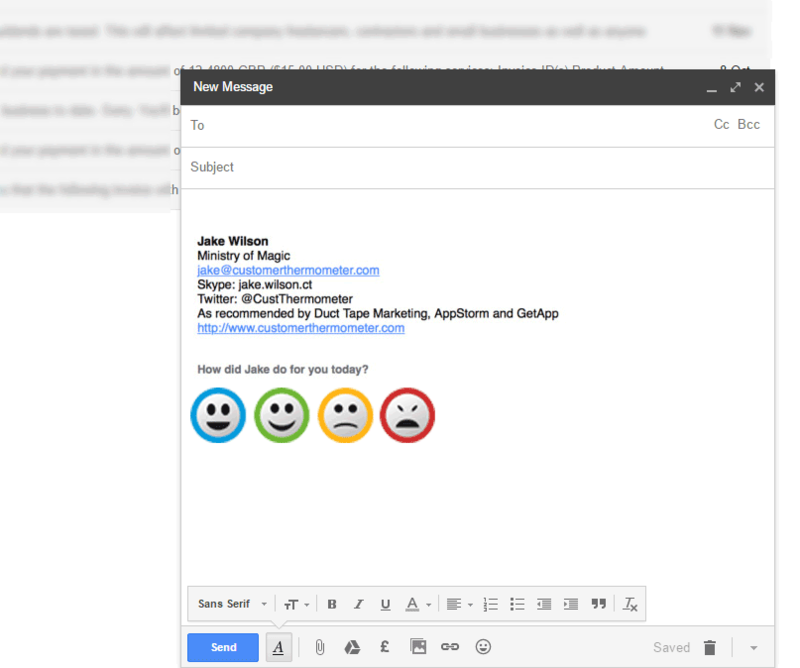 add a Thermometer to your Gmail signature? We could talk all day long about how useful and insightful our Gmail surveys are. But the only real way to get to grips with the system is to give it a whirl! That’s why we’re giving you ten free surveys to play with. Here’s how it works. Running a successful, thriving business means getting answers fast. The quicker you can identify customers’ feelings, opinions and experiences, the faster you can start to put things right when they’ve gone wrong. Or do more of the things that please your audience. You might need to tweak an offering so it appeals to more people, align your pricing structure closer to a competitor’s or improve your delivery options. Whatever it takes to make people happier, you want to get it sorted in the shortest possible time to protect and improve your bottom line. What can you use your ten free Gmail surveys for? You can use your ten free 1 click Gmail surveys to take the temperature of your audience for all manner of reasons. You might want to find out which kind of event people are the most likely to attend, poll them about a new product you’re thinking about developing, survey their feelings about a certain service, collect customer email addresses for your newsletter, or hold a mini-quiz to help make people more ‘sticky’, more loyal to your brand. It’s entirely up to you. First, set up an account via our simple registration form. All you need is an email address and password and you’re off. Your account will go live straight away, and in just ten minutes you’ll have created and sent your first Thermometer. There’s no obligation – we’re confident you will absolutely love the way responses start popping into your inbox more or less straight away. Decide what you want to ask your customers, remembering to use the same familiar tone of voice and style as your website, to support the brand and get the best response rates. Then follow these easy steps. Create a Thermometer template to use for your test – you’ll find a detailed step-by-step guide here. Enable the ‘prompt for email’ address option. Get your icons by clicking ‘generate embed code’. Create a new Gmail signature, insert the urls for the images, generate the icon hyperlinks. Enter the sender’s name and email address. Create the Gmail signature and add the icons. Add a tracking link for each icon. Customize the signature with a question. Click ‘save changes’ and you’re ready to send the first survey. Simple to integrate, no coding or design expertise required. Fantastic response rates as high as 80%. You can customise the rating buttons we provide or make your own icons for people to click, inspired by the question you’re asking or the brand’s own livery and style. You can specify as many as four buttons to get granular answers that provide more information than a simple yes or no, good or bad. As soon as someone clicks on a button, the system automatically registers their opinion. You can create a special customized landing page to say thank you. At this stage you can also ask for extra feedback. Just bear in mind that, thanks to human nature, the more you ask for, the fewer responses you’re likely to get! Because urgent red and yellow ratings are sent direct to you via email or smartphone, you can react immediately, getting back to individual customers to resolve their issues. And you use the list of comments allied to satisfaction ratings to improve the overall way you do business. Click through to our comprehensive User Guide for a step-by-step guide, supported with screen grabs and images, that reveals exactly how to get your test-run going. Consumers love responding to these beautifully simple surveys because it empowers them – they can instantly send feedback, respond on impulse, and know for sure their feelings will reach the right person. The system’s sheer simplicity also plays a part in its popularity. It couldn’t be easier for people to send back their impressions, and it’s completely non-intrusive. Brands love our One click Gmail surveys it because they’re so easy to set up and run, and so very powerful, the perfect way to collect real-time customer intelligence without irritating or over-burdening your audience. You can find out more about why email surveys are so popular here. You can use your ten free surveys to carry out basic AB testing, also known as split testing. It might, for example, involve running two questions simultaneously, each to 50% of your customer base, to find out what style of question gets the most replies, the response rate that delivers the most statistically relevant results. Positive feedback is a pleasure to receive. It tells you when you’re getting things right, which is useful to know because then you can plan to do more of the things that please your audience. But negative feedback is also something to celebrate. Whether it’s from an individual who you can contact direct to resolve a problem, or a pattern emerging across multiple customers, it’s good to know as soon as possible so you can act fast. Because you can dive in and have ten free goes, and because there’s no obligation, there’s nothing to lose. Why not give it a go and see exactly how a Gmail signature Thermometer can open up exciting new vistas for you, deliver fresh ways to improve your services, enhance your products and delight the people who buy from you?